The 4 Cube Puzzle consists, as the name implies, of four cubes. Their edges are coloured red, yellow or blue, and this is done in such a way that all 24 cube faces look different. There are 13 drawings of shapes on the packaging, and the aim is to build those shapes such that where ever two outside faces touch, their colours match. The puzzle was made by Binary Arts, now called Thinkfun. The pictures below shows the arrangement of the colours on each cube. 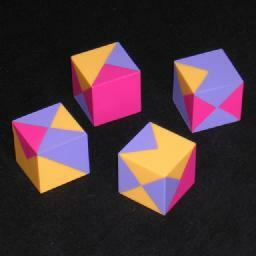 The Four Cube Impossible puzzle was created by Scott Nelson in 1971. This puzzle is based on the MacMahon Squares, the mathematically complete set of 24 colored puzzle squares discovered by Major P. A. MacMahon in the 1920s. Serious puzzle lovers have been challenged by these shapes for half a century, but not until Nelson's work had anyone solved how to place the 24 squares on the 24 faces of cubes so that all edges match. Amazingly enough, Scott was only nine years old when he made this discovery! © 1998 Binary Arts Corp.
ThinkFun, formerly Binary Arts, was the manufacturer. Below are solutions to 13 shapes. Note that only the fifth shape (the 1×1×4 block) and the last shape (the 2×2×1 block) have unique solutions. The sixth shape (the L shape) has only 4 solutions, but all the others have many more.